Have you ever taken a selfie and realized that your teeth look yellow or dull? It makes you want to avoid wearing white, and you feel like covering your teeth. You could use over-the-counter whitening solutions, but do they really work? Or you could do in-office whitening treatments, but do you really have time for that? With professional take-home whitening trays, you can restore your smile’s brilliance and your confidence while enjoying the best of both worlds. Why have my teeth become yellow? Our teeth are constantly exposed to food and drinks that leave stains. Even brushing and flossing can’t remove all the pigment that what we consume leaves behind. Some medications also can make teeth look discolored. Over time and with this exposure, tooth enamel wears down, revealing the yellow dentin under the surface. How can I make my teeth white again? In most whitening solutions, the active ingredient is carbamide or hydrogen peroxide, a safe chemical that bleaches stains from the enamel. The concentrations might be different, but this is the method that most whitening solutions work with, including professional at-home trays. Do over-the-counter whitening solutions work? There are so many options available, from whitening strips to toothpastes, that it can be confusing to know which ones will deliver real results. The truth is that whitening solutions that you can buy in the store have much lower concentrations of hydrogen peroxide and are therefore not as effective as professional treatments. For noticeable results, choose a professional whitening solution. 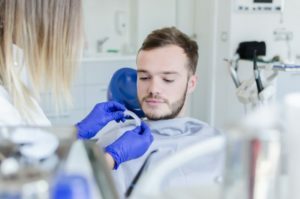 What is the process for professional take-home whitening trays? For at-home whitening trays, you must first meet with your dentist to get impressions done of your teeth. The trays will be custom made to fit your teeth, preventing excess gel from accessing other parts of your mouth. Then the dentist will record the shade of your teeth so you have your “before” picture. In one to two weeks, your trays should be ready, and your dentist will instruct you how to apply the trays and get the best results. Typically, after you’ve brushed, flossed, and rinsed mouthwash to make sure you have a clean slate to work with, you insert the trays onto your teeth for an hour. You need to avoid eating, drinking, or smoking for about 30 minutes afterward. This process is repeated every day for about two weeks. Even if you see results after the first time, be sure to follow your dentist’s instructions to achieve maximum results. Then you can compare your initial tooth color to your new pearly whites. What are the advantages of professional at-home whitening trays? You don’t have to spend long periods of time in a dentist’s office. Who has time for that? You do at-home whitening treatments when it is convenient for you. If you want, you can do the treatment in your pajamas while watching your favorite shows on Netflix. In most cases, professional take-home whitening trays are less expensive than in-office whitening treatments. Unlike over-the-counter whitening solutions, the trays you get from your dentist fit your mouth perfectly, making sure the whitening gel is evenly distributed and works more effectively. Although not as highly concentrated as in-office whitening treatments, professional take-home trays can deliver the same dramatic results. Plus, they contain a higher concentration of hydrogen peroxide than whitening solutions you can buy from a store or online. In the end, professional take-home trays offer you the best of all the whitening options: professional-strength whitening at your convenience and at a discount. With them, you can feel confident in every selfie you take. Turn back the clock on your teeth and make an appointment to discuss if at-home whitening trays are right for you. In addition to practicing at Monet Aesthetic Dentistry, Dr. Leslie Metzger also participates in the American Association of Cosmetic Dentists, the American Dental Society, and the Michigan Dental Society. She is also a recipient of the prestigious Michigan Dental Association Public Relations Award. In her practice, she uses Opalescence® take-home kits for her patients. You may contact her by calling (248) 476-3410 or clicking here.